Some intangible thing about the early El Primero references is ultra-desirable. The movement is remarkable, the case is perfectly proportioned, the dial perennially interesting. They came from a time when Zenith was innovating hard with the first automatic chronograph and leaving the rest of the pack to catch up. The pride they clearly had at the time shows proudly even through the decades. You might imagine the early El Primero as a steel and multicolor affair, but keep an open mind. For the discerning clients who don’t mind stunting a little more strongly, vintage yellow gold lends one hell of a statement. Around 700 examples of the G381 were produced from 1969 until 1972, making this gold sister the rarer bird. Also keep in mind that it isn’t just a beautiful and rare piece. It’s mechanically very significant. 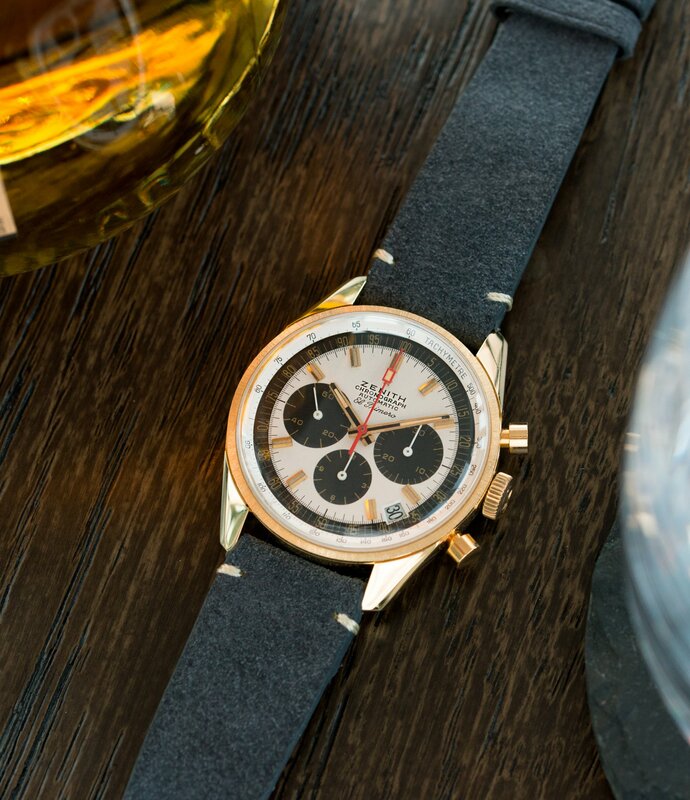 The self-wound cal 3019 is the original automatic chronograph. The 31-jewel powerhouse beats at 36000, high frequency than most of the time for a tighter accuracy. Similarly, the 50-hour reserve beat the standard 46 of the time. Zenith were just on fire. This Zenith G381 El Primero comes from A Collected Man, London. Let’s not mix words: it’s perfect. The dial has faded its gold to brown only slightly while the white has, also only slightly, warmed. The original tritium is intact. The black subs have lightened just a fair bit in age. The 38mm case appears to have been polished. Honestly, in gold, I don’t mind that. The movement looks like it just came out of Switzerland yesterday. Little to no corrosion across the entire piece. Find this G381 here for 9000 GBP.